James Joyce's Ulysses comes to life this week in Dublin, Ireland but also right here in Quebec. Bloomsday is officially June 16th, the date was chosen by Joyce because it was the date of his first outing with his wife-to-be, Nora Barnacle. Ulysses centers around the protagonist Leopold Bloom, although the book has so many other memorable characters. More than sixty cities around the world will celebrate Bloomsday, it's a week-long celebration in Dublin. 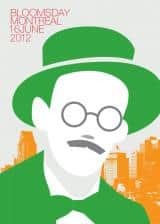 The McGill Community for Lifelong Learning is sponsoring Bloomsday events in Montreal. Sonali Karnick spoke with Judith Schurman who is helping to arrange the activities.